Not to be confused with Spike Top. 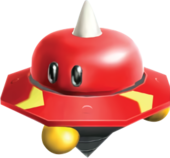 A Spiky Topman is a variant of Topman that appears in Super Mario Galaxy as part of the Topman Tribe. It resembles a large red top with a single spike on its head. Spiky Topmen appear as regular enemies in the Battlerock Galaxy and the Dreadnought Galaxy. Spiky Topmen can use a spin attack which does not damage Mario, but push him backwards. However, the spin can push Mario into other hazards that may hurt him. In addition if Mario attempts to stomp a Spiky Topman or lands on one he will be hurt by the spike on its head. Mario can defeat the Spiky Topmen by using their own strategy against them, Mario's spin attack or a Star Bit can knock the enemies into electric fences causing them to explode. Each one defeated would give a Coin. Sometimes, when Spiky Topmen are defeated, they make a gate or door open leading to the next part of the level. They reappear again in Super Mario Galaxy 2, but only in the Space Storm Galaxy. They play a rather important role to getting the secret Power Star. After talking to the Silver Gearmo, he tells Mario to bring him a Spiky Topman in exchange for a Power Star. Spiky Topmen made a return appearance in Mario Kart Wii as part of an online tournament that took place between June 1st to June 9th, 2008. The tournament took place on a special arena known as Galaxy Colosseum, and involved knocking four Spiky Topmen off the edge using Triple Mushrooms. It made a return as the second competition of both June 2009 and March 2010, but the player had to push a total of six Spiky Topmen off the stage and the outer rings of the arena broke off. This page was last edited on July 18, 2018, at 11:35.